This is a must read if you are interested at all in the deeper levels of a relationship with God. The author, Martin Laird, knows this inner landscape and especially how to deal with all the challenges that life brings to us through the silence. I don’t know when I’ve read a spiritual book that “gets” the message so loud and clear to me. I was amazed to feel affirmed in how God has led me and watched over me and helped and supported me throughout my life in Christ. 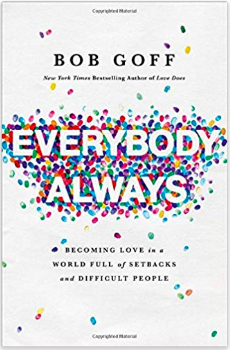 “Everybody Always” by Bob Goff is about how we can actually love as followers of Jesus. He explains all the pitfalls that keep us from loving and then shows us how it works. Near the end of the book he talks about witch doctors in Uganda and how they sacrifice young children for their evil worship. And how he gets one convicted and sentenced to life in jail. So this man is his enemy, and he tells the story of how he comes to love his enemy and how that changes everything. A Must Read! 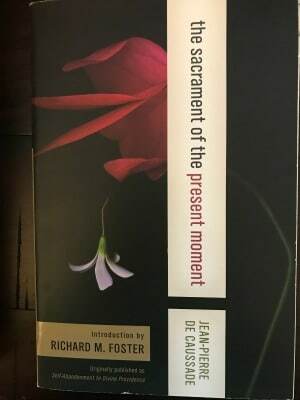 “In this classic of wisdom, hope and inspiration, Jean-Pierre de Caussade offers guidance for daily living in communion with God. He summons readers to holiness, reveals ways to conquer self-love and pride, and shows how God speaks to us through every moment of every day.” From the back cover. 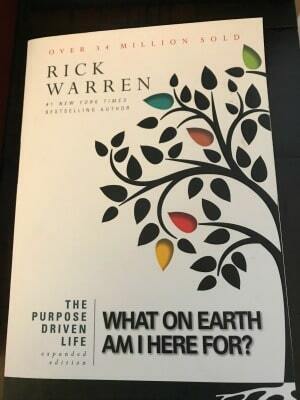 This is an expanded version of Rick Warren’s Purpose Driven Life, What on Earth Am I Here For?, a journey of 42 days with discussion questions and other resources. It is an excellent rendering of the question of purpose which we all need to address with our God.